The Mercury statue, a landmark of downtown Rochester, was created in 1881 by J. Guernsey Mitchell. Mitchell was commissioned by his brother-in-law, William Kimball, the owner of the William S. Kimball Tobacco Factory, located at the corner of Court Street and Exchange Street, to craft this statue out of riveted copper plates fabricated by the John Siddons Co located on East Main St. Once the 21 foot tall, 700 pound statue was completed, it was installed atop one of the factory smokestacks and quickly became a hallmark of the Rochester Skyline. re-introduction to the Rochester skyline — this time atop the Aqueduct Building, one block north of its original home. Ralph Avery painted a number of famous paintings of the statue. 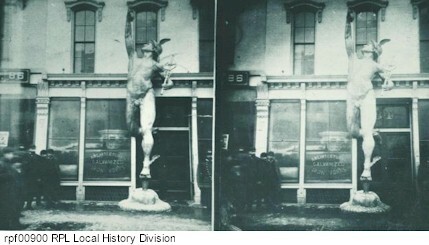 The Mercury statue outside the building of John Siddons' Architectural Galvanized Iron Works at 84 E. Main Street. A group of people stands to the left, helping to demonstrate the size of the statue. Mercury was designed by J. Guernsey Mitchell and constructed by Siddons of riveted copper plates.